One of my latest e-designs was for the stylish, sweet as pie Tiffany from Savor Home. We worked on her master bedroom together, incorporating pieces that she already has (like that gorgeous bed!) with new, chic pieces and planning a functional design for the space. I think my favorite element in the room is the gallery wall of gold frames behind Tiffany's bed. It's tough to explain, but the wall behind the bed is an awkward, uneven wall which makes any attempt to center the bed (and anything hanging above it) on the wall look crooked. My thoughts were to cover the wall in these beautiful gold frames with chunky white matting to break up the uneven wall. Tiffany can fill the frames with art, black and white photographs... the possibilities are endless! 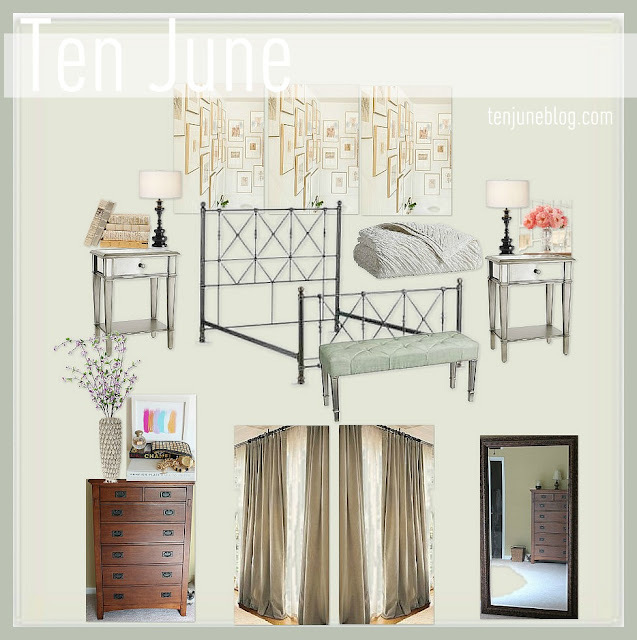 If you're interested in a Ten June e-design, find out more information here or shoot me an email at tenjuneblog@gmail.com and I'll send over all of my design package information! Love what you two came up with! I think we need a house tour!! I love it!! That is exactly what I wanted. You are so talented and I can't wait to start shopping!! Very pretty! The velvet curtains are gorgeous - love those lamps too! Great design board - loooove the end tables! So beautiful! Where is that dresser from? I love it! That gorgeous wooden dresser will really stand out! Looks awesome. 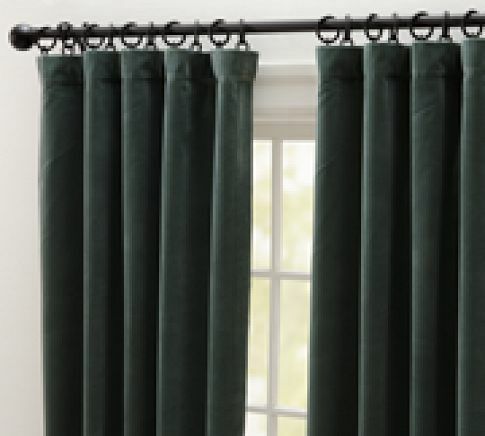 And yes< THE PB velvet drapes are great, we go those up for the new nursery. Good for blocking light. Very beautiful! It looks like it will be a very restful bedroom! 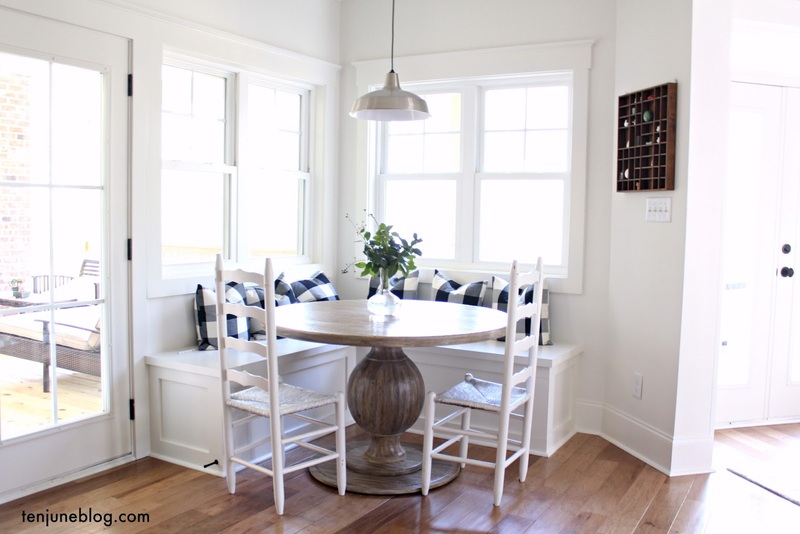 Love the end tables mixed with the wood dresser! Great job! Love this look! The side tables are gorgeous...it's all very romantic and feminine! :) TIffany is a lucky lady! Gorgeous! Loving the velvet drapes... so rich looking. Ooo, pretty!! I love the side tables! Sooo lovely. I bet Tiffany adores it! I think your solution is perfect. Can't wait to see it done! great job!! so pretty! i love those side tables! I love what you did here--that bed is amazing, and those curtains...i hope santa is listening to you. ;) Can't wait to see it in the completed form! What a beautiful room! I love how soothing the colors are. Great job!